Weight-Up Baby! 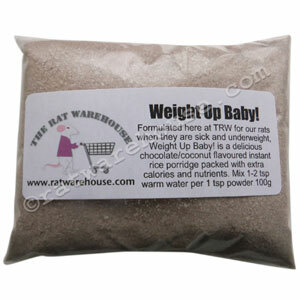 is a high-calorie instant mush created by us at the Ratwarehouse to help some of our own skinny old rats keep some weight on. It is coconut and chocolate flavoured, is full of energy and rats find it hard to resist. When rats get fussy and start refusing certain foods, it is a great treat to have at hand. As it is so palatable and easy to eat and digest, it makes it a fantastic aid to help recovery in post-op rats who may have little appetite. Just add a little boiling water to some powder for best results. The product thickens as it cools down so you may adjust consistency with a little more water and whisk well. As this product is hand-blended, the consistency may vary. You may add Weight-Up Baby! to some instant porridge or baby cereal for a thicker consistency. 100g bag - Multiples might be send in one larger bag unless you request separate 100g bags. Once opened the product should keep for up to 10-12 months. But it normally gets eaten a lot sooner! Contains: Rice, coconut, natural flavours, trace amounts of milk and glucose. Please note that Weight-Up Baby! is not meant as a complete food, so if it is used long term in rats who will only eat soft food, please consider using alongside the Ground Maintenance diet which is a complete diet or supplement with Tiny Animals Essentials or DrS Daily Essentials 1.